For even the most ardent of Horsham fans, it would be difficult to gloss over this season and review it with adulation. Arguably for all people connected with the club, 2014/15 was one of heartache, frustration and disappointment on and off the pitch with notably few highs to celebrate and as such, putting together a full and honest review of our season is probably as hard to write as it would be for anyone to read it who follows and holds the club dear to them. But as the club goes forward into a new chapter, preparing for life in the unfamiliar realms of County League football with the hope of a better future, another old saying, “the show must go on” will ring true with everyone as we look to rebuild and bounce back stronger next season. With club legend Gary Charman beginning his first full season in charge of his beloved Yellows we entered the campaign with the hope that his long and established playing career would be mirrored by a long and established managerial career and, over the course of the summer, realistic hopes were that the club could maintain a respectable league position. However, the departure of Jahmahl King meant there were some big shoes to fill in the heart of defence and the absence of the influential centre-half was felt in our opening game in August as we fell to a 2-0 home defeat to promoted South Park. The Hornets followed this up with consecutive defeats away to East Grinstead and Sittingbourne before earning a decent point at home to eventual runaway champions Burgess Hill. We earned out first league win at the fifth attempt when we overcame Merstham at home, courtesy of goals from Jamie Ampleford and a ninetieth minute strike by Tony Nwackchuku after falling a goal behind. In spite of a less than ideal start, optimism remained high that the team would click into gear and find a patch of better consistency. Progress was made in the FA Cup as we narrowly defeated Corinthian Casuals but, having been drawn at home to Kingstonian in the first qualifying round, Horsham played the role of the underdog to the Ryman Premier Division 2013/14 runners up and fell to a 4-0 defeat with the Ks’ clinical instinct in front of goal proving decisive as we found ourselves eliminated rather quickly from the famous competition in which we had been so successful in back in 2007. League form during September continued to be patchy as we struggled for form, yet the side produced two of the most outstanding displays of the season when we comfortably dispatched Hythe Town 4-1 at home, with debutant Troy Williams rounding off the match with an exquisite thirty yard chip, and away at Whyteleafe when we won a thrilling end-to-end encounter 4-3 with Jamie Cade, Gary Charman, Tony Nwachkwu and an own goal helping us clinch a vital three points. It would, however, prove to be our final league win until mid-December. Cup football provided a welcome distraction from the league, with local rivals Worthing beaten with another 4-3 scoreline at Woodside Road in the Ryman League Cup First Round and that was followed up with a superb 6-2 success at home to Sittingbourne in the FA Trophy Preliminary Round, with a memorable hat-trick and virtuoso performance from Charman. The Trophy became the source of our best performances as we made it to the third qualifying round by knocking out Ware and Barkingside, before succumbing to a 6-0 away day defeat at the hands of Hayes and Yeading, the Conference South side easily outclassing us on a disappointing afternoon in Maidenhead. Any other remaining hopes of cup glory were also extinguished during November with Worthing avenging that League Cup defeat with a 0-2 Sussex Senior Cup second round victory, and our interest in the League Cup was ended when eventual Division One South League champions Burgess Hill dispatched us 5-1 away from home to leave us with only league survival to contemplate for the remainder of the season. Less than two weeks after that League Cup loss we returned to Leylands Park where our supporters endured a truly wretched afternoon of football as the Hillians taught us another footballing lesson, this time scoring seven times without reply as we were cast three points adrift at the bottom of the table. Despite the heavy defeat, the team showed character to bounce back to beat Sittingbourne 1-0 and claim a point at home against Walton and Hersham but the poor form soon returned to haunt us as we closed out 2014 losing three in a row to Faversham, Corinthian Casuals and Worthing, scoring just one goal and conceding eleven with Ryan Woodford picking up an unwanted record of three consecutive red cards in as many matches. The run also culminated with the Board of Directors reluctantly accepting Charman’s resignation and thus ending his long, illustrious career at the club. Off the field supporters, and the clubs Directors, were gearing up for Horsham District Council’s long awaited decision on our Hop Oast ground application which was heard on 20th January. As no one will need reminding, the decision to refuse the application was met with widespread disappointment, anger, and disbelief by everyone connected to the club and compounded the misery of supporters who had hoped a turning point could be reached to secure the club’s future off the pitch as well as become a potential catalyst to finally kick start the season on the pitch to escape the drop. With Anthony Storey and Cliff Cant taking on a joint managerial role on a temporary basis, it seemed fortunes could be revived when, after opening with a harsh stoppage time defeat to Hastings, the duo oversaw a 1-0 win at Carshalton Athletic and added three wins on the bounce to lift the mood against fellow strugglers East Grinstead, Walton Casuals and South Park. Having led the club off the foot of the table and out of the bottom two for the first time since October, they were offered the job on a permanent basis until the end of the season after meeting the BoD’s target. The change of manager also saw a dramatic shift in the playing staff; in came the likes of Richie Welch, Gregg Berry, George Branford, Richard Byrne, Bailo Camara, Tom Vickers and Trevor McCreadie while out went Max Miller, Ade Akande, Ross Morley and Harry Smith. However, the decision to appoint the duo permanently appeared to put the kiss of death on the side as Horsham then lost the next seven matches in a row, including heavy defeats at Folkestone Invicta and Hythe Town, and a run of over four hours in which we failed to score before finally managing to win 2-0 away at Hasting United’s Pilot Field – our first win in just under two months. The abysmal run and inevitable relegation led to the eventual dismissals of Storey and Cant over the Easter fixtures when, although we managed to beat Corinthian Casuals 2-1, a shocking 0-3 surrender away to Walton and Hersham proved to be the death knell for the pair who were given their marching orders with the club all but guaranteed to go down. 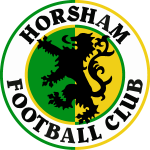 New manager Dominic Di Paola was appointed with the clear remit of rebuilding Horsham FC, the manager coming to us having tasted success at East Preston whom he steered to the Sussex County League championship at the end of the 2013/14 season. Di Paola’s first game in charge of the Hornets ended in a 0-2 defeat away to league runners-up Faversham Town that confirmed our relegation to the County League, ending our forty-two year stay within the Isthmian League. But, in true Horsham FC spirit, the club’s supporters showed at Tooting and Mitcham in our final game of the season that they would continue to follow the club through thick and thin, turning out in good number and sporting an array of Elvis Presley costumes. Much like Presley devotees, they demonstrated that they believed the club was very much still alive and well and would look to the next season with renewed optimism that we will be back. The job will now fall on Mr Di Paola to revive this fallen giant of Sussex football.